A reliable source for Industrial Workbenches information and a resource for accessing leading Industrial Workbenches and suppliers. These industrial workbenches create safe environments for the workers and offer efficient places for carrying out job tasks.For an industrial workbench to be effective, it should provide workers with easy organization and access to all tools and supplies necessary for specific tasks. Industrial workbenches should be adjustable to the specific needs of individual workers. Many industries and different sectors within industries use industrial workbenches in order to take physical stress off workers, thereby increasing productivity. They can be built for rugged durability and harsh work environments and can be made to fit packing, shipping, or laboratory requirements. 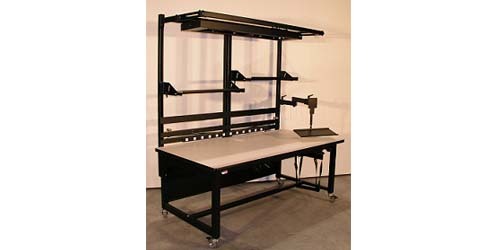 Industrial Workbenches Industrial workbenches are sturdy tables used in the construction and repair of industrial products and have adjustable shelves, drawers and height. They are often used to create efficient spaces in which people can perform a set of specific duties. Industrial workbenches differ from industrial work stations in that when referring to a workbench it is typically meant the actual table or work surface, whereas when referring to workstations it is to include the table and its surrounding components including shelving. Typically used for heavy-duty applications, industrial workbenches are most commonly fabricated from tough, durable metals or plastics such as stainless steel or high density polyethylene (HDPE). In addition, a combination of both types of materials can be used as well. In order to meet many employee workplace regulations, ergonomic industrial workbenches are often necessary for the safety and health of workers. Ergonomically designed adjustable industrial workbenches can prevent injury and increase productivity by allowing the work environment to conform to workers instead of forcing workers into environments which may be physically stressful. Details such as height, drawer placement, chair height and cabinet arrangement should be able to adapt to each individual worker so that no extra stress is created. Though adhering to biomechanical principles, customized industrial workbenches are widely used to keep workers healthy, injury-free and productive.